Is a “recipe” with one ingredient really a recipe? I don’t know the answer to that, but I’m still sharing these yummy Cheese Chips I made anyways! I experimented with a variety of cheese to find the best one for this recipe. My favourite is the shredded Mexican cheese you buy in the bag. I found it made the crispiest cheese chips out of all the cheese I tried. Place a piece of parchment paper on a baking sheet and put your little mounds of shredded cheese evenly spaced on top. Bake for about 5 to 7 minutes, depending on your oven. You’ll want them to start looking a little crispy so they’ll keep their shape. If you overcook, it’s not really a big deal. You’ll just have a crispier chip. Just be careful to not burn them as they do bake quickly! Delicious and so darn easy to make! This yummy appetizer is perfect for people following a low carb lifestyle. Preheat oven to 375F. Lay a piece of parchment paper on two baking sheets. Add cheese to baking sheet, about 1 tablespoon per chip. Make sure to leave enough room in between them so they aren’t touching. Bake for 5 to 7 minutes, or until starting to crisp. Remove from heat and let cool about 5 to 10 minutes. Carefully remove from baking sheet and serve with your favourite dip. I like them with pizza sauce. I’ve experimented with different types of cheese. Parmesan works great, but my favourite is the shredded Mexican cheese that comes in a resealable bag. Cheese chips are a fabulous snack for people following a low carb diet. 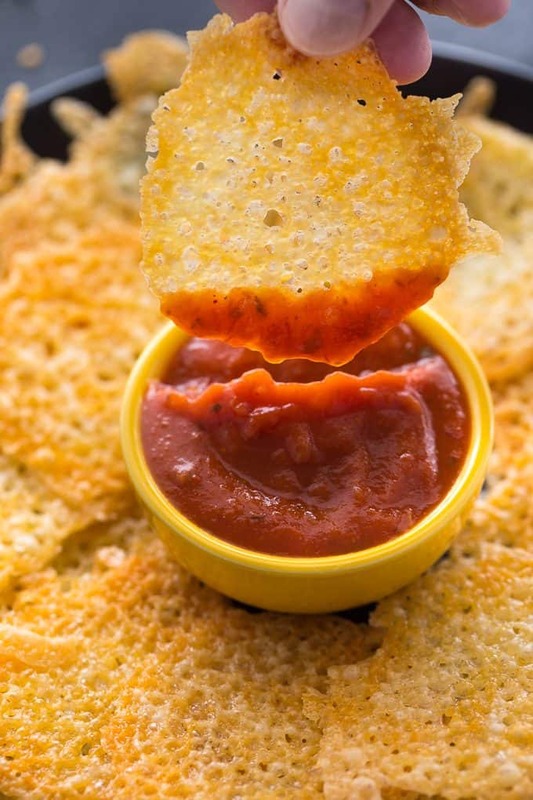 Serve them with some pizza dip and you have a mouthwatering snack! Though I’ve making this recipe for a while now, I discovered another easy recipe to enjoy using a different kind of cheese. 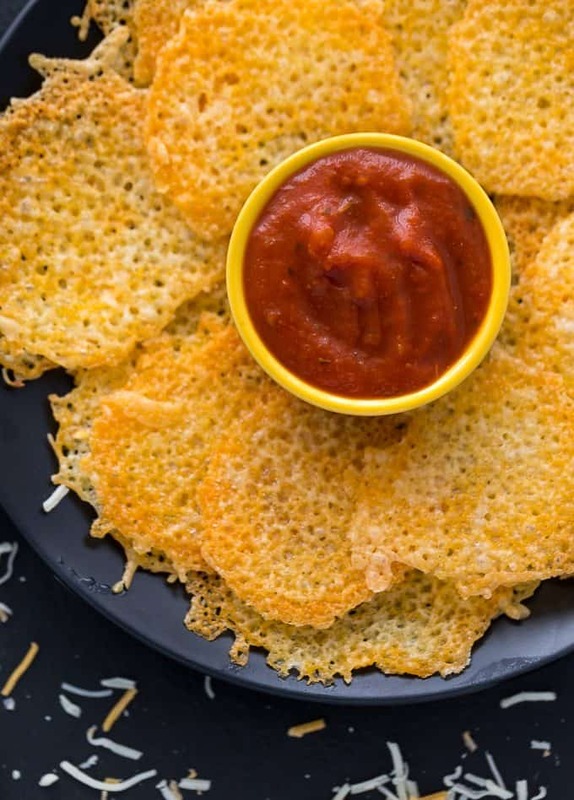 Parmesan Crisps are equally delicious, low carb and super easy to make. For more low carb recipes, check out my Buffalo Popcorn, Chicken and Egg Ramekins, Asian Chicken Lettuce Wraps and Cauliflower Rice Enchilada Bowl. You might also like these Air Fryer Mozzarella Balls. Have you ever tried cheese chips? oh I’m so trying this today! What a great idea, I always love the crispy cheese bits that fall off when I making something with cheese on it in the oven. 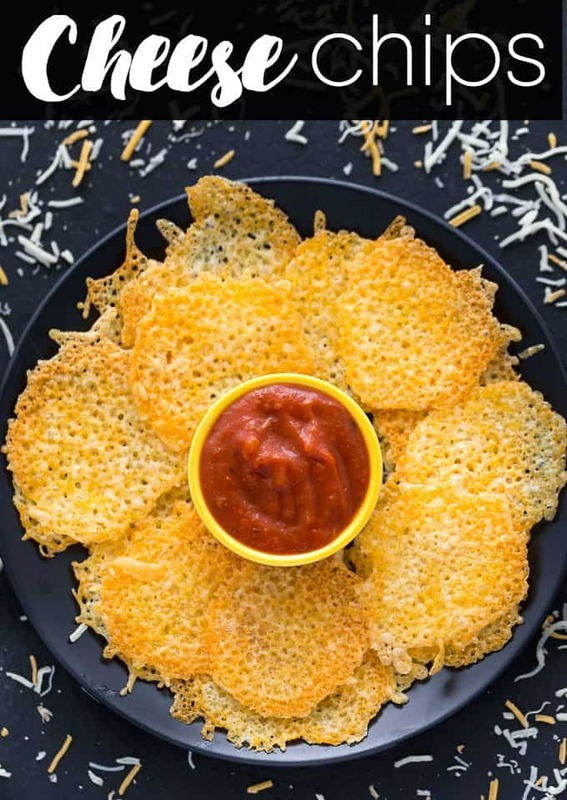 Never thought about making cheese chips – great idea! These look delicious and unique. These sound like my heaven! I need to try them! 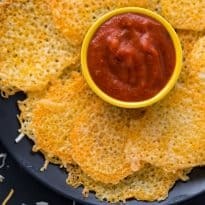 I love these and always make them when I have any leftover shredded cheese and the oven is on, they are so addicting!! What a DECADENT treat idea!!!! I know someone who makes paremsan cheese chips and crumbles them over dishes… so good! I haven’t tried cheese chips before, but will now! oh my goodness Stacie! Say this in your email and I just had to click over. PINNED THIS BABY! I love making these with Parmesan, but I haven’t tried it with cheddar. Cheese anything is A+ in my book. What can I use if I don’t have parchment paper? So funny you posted this; as I have shredded Mac and Cheese. It tastes unbelievable. I was just thinking how to make this. Any advice about what paper; they would not stick to would be great. You can make them without parchment. Cheddar is pretty oily, so I think it would come off pretty well from foil lined baking sheet, as long as it’s not burned. Caught my attention in your email, I love cheese and what a great simple idea!! Pinned so I will not forget! What a fabulous snack idea! I’ve never done this but will definitely try now. Thanks for posting. When making Nachos I love the cheese that falls off and gets crispy but I never thought of making it by itself so Thank you for this post!! Yum, this look delicious and something even I could manage. Thanks for sharing! Oh yum! I am going to be making these delicious cheese chips with the kids. They will love them! wow I did not know you could do this!!!!! I am trying this for our weekend snack!! Can’t wait to try….looks so yummy. Who would have known! This will be fun. Oh it is a recipe alright — a mighty delicious one! How great – I wouldn’t have thought to use those shredded cheeses! They have some nifty blends. I love how simple this is… yet I can already imagine great rewards. Really easy to scale up or down too, LOL. Thank you! Wow that is something. I have never seen that done before. These cheese chips look scrumptious. I can’t believe how much Costco is charging for their Parmesan Cheese crisps! I’ve always cooked mine on the stove top but this is so much more practical! These look amazing – and so easy!! Thanks for sharing! I have to try these.They will be unique for me as I never heard of doing this before.They really look delicious and will go well with all my homemade salsa. These look delicious! They could be great on a road trip, however you would have to get clever with the storing of them. Pinned again! SOUNDS AMAZING! YUM! These look so insanely good! Nothin’ is better than cheese! Well, maybe coffee! Thanks for sharing these at the #SmallVictoriesSundayLinkup! These sound delicious! I am the person that is always peeling the burnt cheese off the pan to eat, so these are right up my alley! Thanks so much for sharing your awesome Cheese Chips, I just love Cheese Chips! Hope you will come back to see us at Full Plate Thursday real soon and have a great week! Another fantastic recipe Stacie and gorgeous photos, as usual. These sound amazing. Who doesn’t love melted cheese? Thanks for sharing at Thriving on Thursdays last week. I’m featuring your post at tomorrow’s party. I love any form of cheese! Baked cheese chips sound amazing! Thanks for sharing with our Merry Monday party. Hi Stacie, I love this simple tasty recipe! Perfect football snack food! Your post will be Featured at the new Merry Monday party tonight! Thanks for sharing with us. Pinned. how long do these keep for? do you have to refridgerate? They taste the best if you eat them hot and fresh out of the oven. If you can’t enjoy right away, then refrigerate, but they won’t be as tasty unfortunately! I just made these, and while the taste is good (ok, great! ), the chip itself is kinda chewy, rather than crispy. I did two different kinds: parm and cheddar. Both were spread thin, and I cooked them the full 7 minutes, and they were brown around the edges. The brown parts are crispy, but that’s just because it was within a moment of burning. I’ve left them out, but they haven’t crisped up. Is it solely the type of cheese — so if I use the Mexican blend they might be crispier? I find they vary greatly depending on the type of cheese you use. Just experiment with the different cheeses until you find one that you like. I like the Mexican blend. There is enough grease in the cheese so that it doesn’t stick. I just made these and although they are very delicious they are sticking to the parchment paper. Is there a trick? Or perhaps cooking spray first? You could try using cooking spray and see if that is any better. I use a metal spatula to remove them and they are fine for me. Good idea for a snack, we experimented with 3 mini peperoni, I let them melt a few minutes before adding and topped with a small pinch of parmesan. I could have fun with this. I also baked a little longer.